Warning: This post contains references to Aboriginal people who are now deceased. The books referred to in this post may also contain references and images of deceased Aboriginal people. My Ngarrindjeri Calling by Doreen Kartinyeri and Sue Anderson (Aboriginal Studies Press: Canberra, 2008). “Never put black history on white paper” the elders taught her. One time Doreen Kartinyeri did not follow this instruction. She wrote about secret women’s business on Kumarangk (Hindmarsh Island), South Australia, in a bid to stop the desecration of important Aboriginal sites on the island. The instruction, “to be read by women only” was written on the outside of the sealed envelope and it was sent to the office of the Federal minister for Aboriginal Affairs in Canberra. In this memoir Doreen Kartinyeri gives her explanation of the Hindmarsh Island Bridge controversy of the 1990s. Kartinyeri shares the story of her life and explains how she came to know about the secret women’s business. Her life story clearly establishes her expertise in Aboriginal knowledge and her identity as a Ngarrindjeri woman. Kartinyeri was devastated when the Federal shadow minister for the environment, Ian McLachlan, threw her instructions aside and tabled the contents of the envelope in parliament. “I knew I would pay for this error of judgement”, she says. “That day my mi: wi [soul, spirit] was ruptured. I should never have put black words on white paper, and my punishment for breaking that Ngarrindjeri law was about to begin.” “It was still no consolation when two days later McLachlan did resign or even when Deane Fergie brought the secret envelopes back from Canberra. I was feeling really disturbed, really sick to my stomach about it all”. A Royal Commission was held in South Australia to ascertain whether the Aboriginal women had fabricated evidence about secret women’s business. It concluded that they had lied. “I cried enough tears to flush the River Murray”, said Kartinyeri. Today is New Year for millions of people around the world. 21 March marks the equinox and also one of the most ancient festivals still celebrated today – Naw Ruz. This festival is celebrated throughout central, western and southern Asia, the Balkans and the Caucasus. The reason that I am celebrating it is because it is also a holy day for Baha’is. It marks the end of the annual nineteen day fast. The Baha’i Fast is a period of spiritual reflection for Baha’is. It is an opportunity to replenish one’s spiritual batteries. I really felt that I needed the Fast this year and was looking forward to it so much that I started my reading for the Fast early. During February I had become bogged down in my reading and probably a bit jaded at life. I needed the spiritual boost that the Fast gives. Aside from reading the Holy Writings, I read several books about the Baha’i principle of equality between women and men. Baha’u’llah is the Founder of the Baha’i Faith. As you can see from the above quote, the equality between women and men is a foundational principle of the Baha’i Faith. 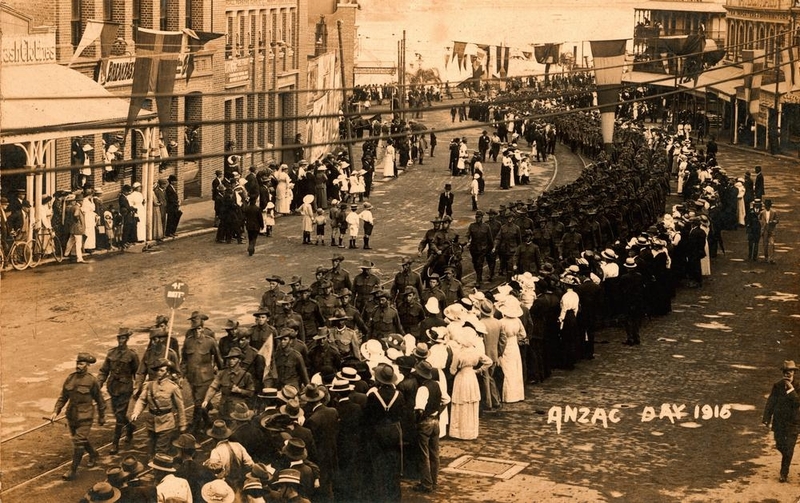 Anzac Day procession, Brisbane, 1916. Each year Australians and New Zealanders observe Anzac Day on 25th April. ANZAC Day is a day when Australians and New Zealanders remember their war-dead and the terrible suffering soldiers endured while carrying out what they were ordered to do. 25th of April was chosen for Anzac Day in recognition of the day when Australian and New Zealand troops landed on the shores of Gallipoli in Turkey during World War One. This did not lead to victory but to a stalemate costing the lives of many men on both sides. Anzac Day is not a celebration of military victories, nor is it a remembrance confined to memories of World War I. It is a commemoration of the devastation wreaked by all military conflicts. This post started with the question; how and when was the first Anzac Day commemorated? I thought I knew the answer but as the process of writing for publication requires writers to carefully justify opinions and facts I did some further research. The application of this discipline quite often leads to surprises for the writer on the way and this was certainly the case for me.